Born in England to a Dutch mother and a brown father, a woman's search for identity leads her to a remote island paradise in the Pacific. Espasio 'Fu' Fuata met his wife, Marion in the 1960’s in London while he was a member of an indigenous New Zealand Maori band. The pair fell in love, married and had three daughters, Tiara, Ngaire and Muringa - names Marion researched in a Maori dictionary believing that Fu was from New Zealand. Fu eventually discloses that he was, in fact, from a remote Polynesian outlier 450kms north of Fiji called, Rotuma. Fu emigrated his young family to coastal New Zealand. Years on and Fu's daughters have all grown up and had families of their own. Fu’s health takes a turn for the worse and his life long wish to take his family to his beloved homeland, Rotuma seems grim with his deteriorating health which prompts Fu's daughter, Ngaire to make the long journey without him. Life on the island is simple and beautiful. Ngaire and her daughter Ruby experience the infectious Rotuman culture, spoilt with an abundance of food, weather and idyllic beaches unscathed by tourism. After almost a month away Ngaire and Ruby make the long trip home with stories and messages from Fu’s beloved homeland. This story is about a journey of self discovery and cultural transmission from one generation to another, and in this case, three generations of Rotumans. It's about discovery - of culture, family, identity and belonging, the very things that define us as humans. Selected for 2012 FIFO Oceanic Documentary Film Festival, Papeete, Tahiti. 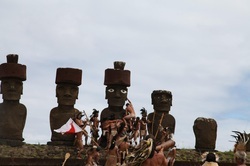 Waka Huia reporter, Mana Epiha, embarks on a personal journey to one of the most remote islands on the planet, Rapa Nui (Easter Island). In this documentary, Mana reveals a rare inside look at the tribulations of modern Rapa Nui who share a similar history, culture and language with New Zealand Māori. Mana is taken into heart and home and discovers life on the island through a fisherman and his family, a musical activist, and a local guide. He is captivated by the presence of the ancient volcanoes and the spell-binding aura of the iconic giant Mo’ai statues scattered on this eerie landscape. It’s through this passage of discovery that Mana begins to realise his own individual lineage unravelling before him.